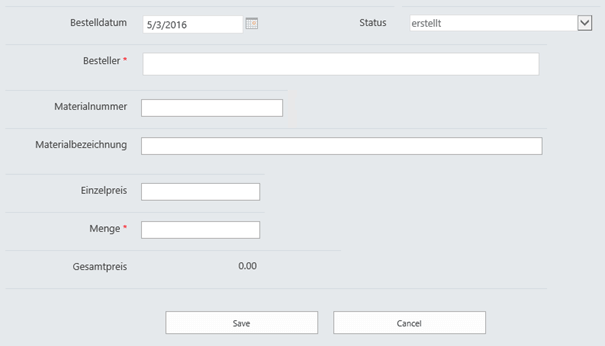 The employee creates an entry in that list, which triggers an approval process in form of a Nintex workflow. After the approval the employee can go to the storage with a printed confirmation an they can collect their approved material. The cost where transmitted via scheduled workflow to the finance department, which were then charged on the salary of the employee. Mandatory input of product information should not be entered manually by the user. This would lead to spelling mistakes or wrong information. 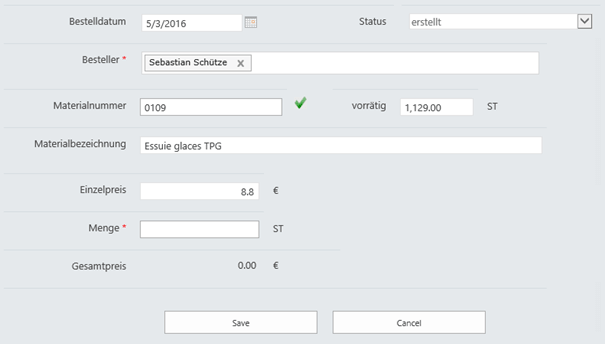 Below you can see the Nintex form that is used. For the identification of the product, the SAP material number is used. This number is unique. Since inputs like price or technical data of the product can lead to errors, two different methods can be used to get the data directly from SAP. On one hand you can use ERPConnect Services Nintex workflow actions. Code sample to load SAP data with a BAPI function. In line 1 the executFunction method is called to call a RFC enabled building block. Additionally the function to call is named in line 2 together with the parameters in line 3 to 8. In this query the product is searched my the material number. In lines 9 to 14 the return data on sucess are proceeded and from line 15 to 19 when the request failed. You can go much more wild with the library and Nintex forms. But to get started is pretty easy!